Highest IT Security Standard for maximized Data Security! For AGNITAS the topics of data protection and data security have top priority. Since the company’s foundation in 1999 we have observed the highest security standards for physical, electronic, and legal data protection measures. With the implementation of a management system for information security conforming to the ISO 27001 norm, AGNITAS ensures the confidentiality, integrity and availability of information within the sphere of influence of the entire organization. And with full compliance to the regulations of the new EU GDPR, of course! Your data are only hosted in German data center in Munich. 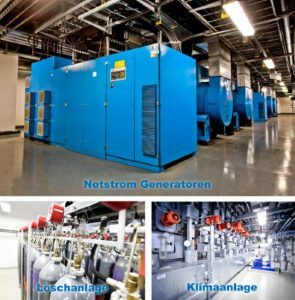 AGNITAS host data exclusively in German data centers! Customers of AGNITAS don’t have to worry, that international authorities or secret services can claim for access to their data. We host all data exclusively in German data centers and the German data protection law applies, which is one of the strongest worldwide. 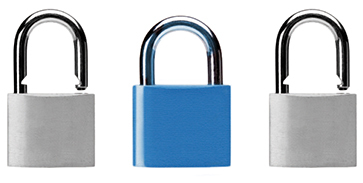 Besides through the ISO certification AGNITAS grants for highest standards in data protection and data security. 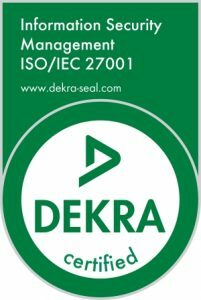 With the certification for ISO standard 27001:2013, the DEKRA granted AGNITAS the highest IT security standard for the whole company. The existing certification has been extended in 2017 by norms ISO 27017:15 for maximum data security in the cloud and ISO 27018:2014 for data protection in the cloud. The ISO 27001 norm defines the requirements for the manufacture, commissioning, operation, monitoring, maintenance and improvement of a documented information security management system (ISMS), taking into account IT risks within the entire organization. Our hardware is located in a trusted high-end data center in Munich, to which we have both physical and electronic access at all times. Guaranteed availability of 99.99 %. We gladly answer your questions about data protection & data security, including necessary adaptions for compliance with the EU GDPR!